The moment Tully saw Frill, he fell in love. 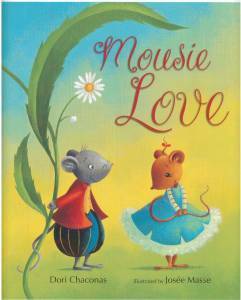 What exactly will Frill say in this tender mousie love story? Publisher's Weekly: In this rodent screwball comedy, a boy mouse named Tully and a girl mouse named Frill meet cute while fleeing a rapacious cat. Tully is so smitten that he can think of nothing but proposing, even when the cat is breathing down their necks; Frill stays focused on the here and now, thus ensuring that the couple survive to celebrate their wedding on the final page. Although Chaconas's (Baby's Song) heroine would have benefited from a more forceful personality (she's more June Allyson than Katharine Hepburn), the text is breezy enough to keep the action bouncing along, while the sturdy, recurring narrative motif—proposal, chase, recovery—should tickle readers' sense of anticipation (a refrain tees up every chase: “Frill didn't say no. She didn't say yes. She didn't say maybe”). As always, Masse (The Princess Who Had Almost Everything) employs a spectacular sense of burnished color. The images never quite take off—the cat feels flat, and the protagonists are overly coy—though the painterly, canvas-textured renderings, while dampening the action somewhat, lend an air of vintage storybook romance.